Konehali Gugushe is a Chartered Accountant and holds a Bachelor of Commerce from Rhodes University, a Certificate in the Theory and Practice of Auditing – University of Natal, and a Post Graduate Diploma in Accounting from the University of Cape Town. Kone is the Chief Risk Office for the Landbank, where she is responsible for the Enterprise Wide Risk Management function of the bank. 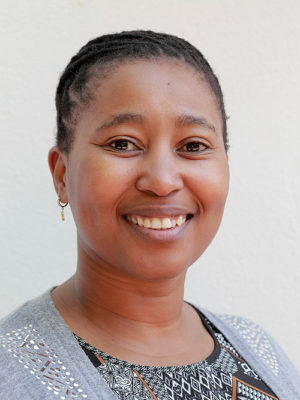 Prior to joining the Landbank, Kone was with the Nedbank Group for 8 years where she held various positions, the last being Divisional Executive: Corporate Social Responsibility for Nedbank Foundation, responsible for managing the Nedbank Foundation, the primary CSI arm of the Nedbank Group, including strategy development, implementation and operational administration. Her responsibilities extended to co-ordinating the group-wide CSI strategy implementation and reporting for the Nedbank Group. Other roles within the Nedbank Group included Senior Portfolio Manager – Group Credit Risk Monitoring, where she was responsible for the evaluation of credit risk associated with lending and investment activities undertaken by the bank. She chaired various credit committees, primarily Nedbank Corporate Banking and Nedbank Africa, while acting as Deputy Chair for the Financial Institutions and Sovereign Risk Credit Committee of Nedbank. Before Nedbank, Kone worked for SAFIKA INVESTMENTS (PTY) LTD, as Private Equity Executive, where she was part of a team that managed a R310 million fund. She also spent time at JP MORGAN EQUITIES as Associate Equity Research Analyst. Kone’s career started at Moores Rowlands in Cape Town, where she was Trainee Accountant.